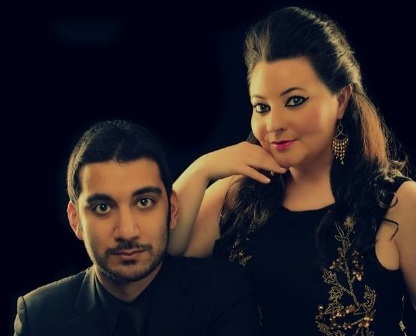 Scottish soprano Alison McNeill and Iranian-Scottish guitarist Sasha Savaloni are the recipients of Enterprise Music Scotland’s 2015-2017 Artists in Residence Award. Both Masters graduates of the Royal Conservatoire of Scotland the Duo made their debut in 2011 at the Big Guitar Weekend Festival gaining a mention in the Classical Guitar Magazine and have since established themselves as the foremost voice & guitar duo in Scotland. They have performed recitals in Spain and throughout Scotland, at prestigious events such as Clasicos en Verano Chamber Music Series in Madrid, Westbourne Music Series, Edinburgh Fringe Festival, the Big Guitar Weekend Festival and were recorded and interviewed for the prestigious BBC Radio Scotland Classics Unwrapped series. Their performances have received great praise and have been described as “Quality music at its best – classical guitar and a voice to die for”. I was immediately taken by their understanding of the style and how they captured the mood and dynamic of the songs with enormous ease. Alison’s poise as an artist, her ability to tell and put across a varied programme of Spanish songs was way beyond her years and experience, and this is aided by a solid vocal technique which allows her plenty of scope for colour and range to paint the pictures she able to do with her voice. Although I know she enjoys performing a wide range of repertoire she has a special connection with Spanish.Sasha is a world class soloist in his own right, but he is also an excellent accompanist and has an innate capacity to listen and follow, and was there for every nuance that Alison delivered. They complement each other perfectly on stage, Sasha’s slightly reserved approach is balanced by Alison’s warm and natural delivery both are excellent communicators. Repertoire is something they work hard at, arranging much of what they perform. Jamie McDougall, BBC Radio Scotland. Alison McNeill graduated with a Masters in Performance from the Royal Conservatoire of Scotland in 2013 with scholarships from the RCS Trust and ABRSM. She has performed as a soloist all over the UK, Holland, Spain, Italy, Germany, Austria, Japan, America, Pakistan and Mexico and has been broadcast on BBC Radio Scotland, BBC Radio 3, BBC Radio nan Gaidheal and Spanish and Mexican TV. As an experienced and sought after recitalist, Alison has performed in Tokyo at The Lyre (Japan), Minami Aizu Concert Hall (Japan), The International Music Centre (Vienna), The Juung Vocal Series in Den Haag (Holland), and a five-state tour of America with contemporary vocal quartet Scottish Voices led by composer Graham Hair. In Mexico, Alison has performed Mexican Baroque repertoire with Baroque Ensemble Ditirambo, recitals with guitarist and composer Javier Hernandez Tagle and a cross-cultural folk fusion project with ensemble La Camaraderia. As a specialist in Spanish Song, Alison is the 2012 Winner of the Andres Segovia prize for Spanish Song and is the only non-native Spanish speaker to win this award. Alison has studied with the famous mezzo soprano Teresa Berganza, the late great Miguel Zanetti, Miguel Angel Arqued (Teatro Real), Jorge Robaina and Julio Munoz and premiered new works by Spain’s leading composers Anton Garcia Abril and Teresa Bretal in the National Auditorium of Galicia and Atheneum in Madrid. She has also performed in the Manuel de Falla Auditorium in Granada and in the houses of celebrated composers Joaquin Rodrigo and Manuel de Falla. Alison regularly works with Scottish Opera including the roles of Mimi (La Boheme), Carmen (Carmen), Yum Yum (Mikado), Violetta (La Traviata) in the company’s Pop Up Tours and is a frequent oratorio soloist around the UK. As a fine interpreter of Celtic and World Folk Music, Alison has performed for BBC Radio nan Gaidheal, BBC Radio 4, BBC Radio 3, Celtic Connections and the Scottish Parliament with The McNeill Sisters Duo who will release their Debut Album of original songs this year. She has headlined International Folk Festivals as lead singer and fiddler in the award-winning Folk Rock band Reely Jiggered, winners of the 02 abc SoundWave Music competition and Celtic Music Radio awarded their second album Kaleidoscope Album of the Week. In 2018, Sasha won first prize in the Seville International Guitar Competition. Congratulations! Born in 1992, Iranian Scottish guitarist Sasha Savaloni is currently pursuing a Doctoratal degree at the Royal Conservatoire of Scotland under the supervision of renowned performer and teacher Prof. Allan Neave. As a soloist he has given concerts in Iran, Italy, Spain, England and throughout Scotland, performing recitals in venues such as the Kings Place (London), Sage Gateshead (Newcastle), City Halls (Glasgow), Stevenson Hall (Glasgow) and the LCM Venue (Leeds) as well as performances in significant festivals such as the Big Guitar Weekend, Les Garrigues Memorial Emili Pujol, Edinburgh Fringe Festival, Plug Festival and the Ullapool Guitar Festival. As a soloist he has performed with orchestras such as the Royal Scottish National Orchestra and the European Union Youth Orchestra. Keen on chamber music, he has worked with numerous musicians and ensembles, including collaborations with soprano Alison McNeill, flautist Lee Holland and the Red Note Ensemble. His close partnership with soprano Alison McNeill has resulted in recording and interview for BBC Radio in addition to concerts in Spain and throughout Scotland. Sasha and Alison are the 2015-2017 Enterprise Music Scotland Residency Project artists. In 2015 Sasha was awarded the Second Prize, the Audience Award and Prize for the Best Performance of the Contemporary Work at the Miguel Llobet International Competition in Barcelona. Other prizes and awards include 2nd Prize winner of the Ivor Mairants International Guitar Competition and 2nd Prize winner of the Governor’s Recital Prize for Strings in 2015, 1st Prize winner of the North East Scotland Classical Guitar Society Award in 2011, 1st Prize winner of the Chanterelle Guitar Award in 2010 and 1st Prize winner of the International Classical Guitar Trophy at the Glasgow Music Festival in 2009.